Folk lore tells us that the idea for the Land Rover came when Maurice Wilks strolled along the coast at Red Wharf Bay with his brother Spencer. Maurice sketched the outline of the vehicle in the sand, and the rest is history! Last year as the sun set on our Road Run camp fire, conversation turned to how the club should celebrate the seventieth anniversary of the above walk, and creation of the centre-steer. A drive from South to North Wales was decided, and the freely-flowing alcohol encouraged those of us with older vehicles to jump onboard the plan! Over the past twelve months some flesh has been added to the bones of the idea, and two groups are planned for driving to Anglesey - the planned and unplanned convoys! 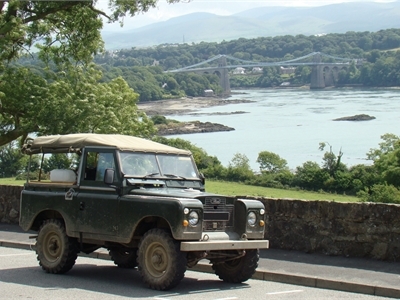 On Friday 16 June interprid explorers will set off from a yet to be decided Cardiff location, heading for Anglesey. Not an overly tricky challenge for those in newer, comfier, vehicles, but cocking a hat to more historic members, we plan to stop mid-Walesish on the Friday night for further progress on Saturday! Being an unplanned tour, that's as much as we currently know! We don't have any takers yet for the planned tour - that's a measure of how rugged and carefree our members are! It could also point to our foolishness! If you want to go on the planned tour then it should suit you to a tee as you're planning it! Come back for more information nearer the time (or visit the forum if you're a member). With only one day of preparation left, everyone is counting down the hours until we start the trip. A WhatsApp group was created a few weeks ago which has allowed everyone to keep in touch so useful help and advice could be shared between the group. Hopefully we'll have a similar photo to the one below with all the Land Rovers on Anglesey, just to prove we all made it. 11 Land Rovers and 22 people will be on the unplanned tour, will we make it on time? How many burgers, hot dogs and pot noodles will be consumed by the party? All good questions and maybe we will have the answer in a few days.